Six players who advanced to the NCAA Women's National Collegiate Ice Hockey Championship in Minneapolis, including four from defending NCAA Champion Clarkson University, have been recognized as 2018 CCM/AHCA WOMEN'S UNIVERSITY DIVISION ICE HOCKEY ALL-AMERICANS. Top seed Wisconsin and semifinalist Ohio State each have a player recognized. The only semifinalist without a player receiving All-American status is Colgate University. Only one player was previously honored: First Team senior defenseman Savannah Harmon of Clarkson. She earned Second Team honors a year ago. Seven players hail from Canada and five players come from the United States. Ontario produced the most (5). There are six seniors, one junior, three sophomores and two freshmen. 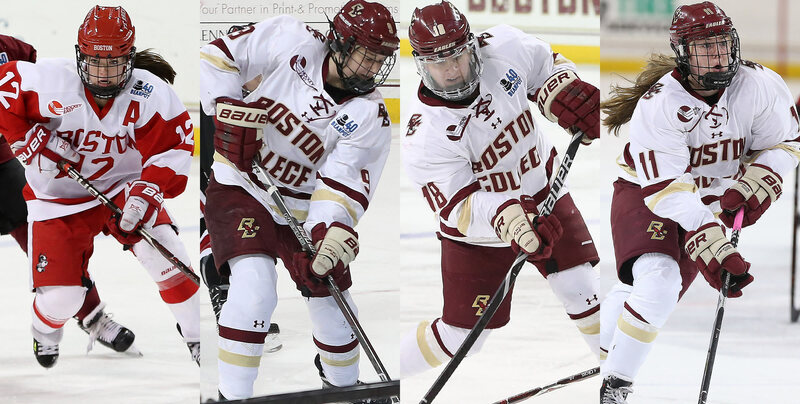 Four selections came from ECAC Hockey, as well as four from Hockey East. There were three players representing the WCHA and one from College Hockey America. The CCM/AHCA HOCKEY ALL-AMERICAN ICE HOCKEY TEAMS are sponsored by CCM HOCKEY and chosen by members of the AMERICAN HOCKEY COACHES ASSOCIATION. CCM is the legendary hockey brand dedicated to the endless pursuit of performance by delivering game-changing, head-to-toe innovative hockey equipment to players worldwide.